Today on the blog sharing some of my favorite ways to decorate Easter eggs. Let me preface by saying that Easter is not about decorating eggs and chocolate bunnies ….it’s the Superbowl of the Christian faith….it’s Holy Week…the time we remember the death and celebrate the ressurection of our Lord and Savior Jesus Christ. I hope you’ll spend time with your family talking about what Easter is really about and maybe you can do that while you decorate eggs and share creative time together. Simply use a variety of Micron pens from Sakura of America to create patterns and designs! Something about classic black and white, right? These paper mache eggs are just tiny oval canvases. Try loose watercolor florals on a few and let the kids try too! I used Prima Marketing Inc. Watercolors for these. Can be found on Amazon too. Another way you can decorate Easter eggs or paper mache eggs …. insects & animals. Bee, owl & mouse featured here but use your imagination! Once again, using my favorite Prima Marketing Inc. Watercolors to decorate these oval canvases. Or try some coastal designs in watercolor blues….perhaps some shell designs! 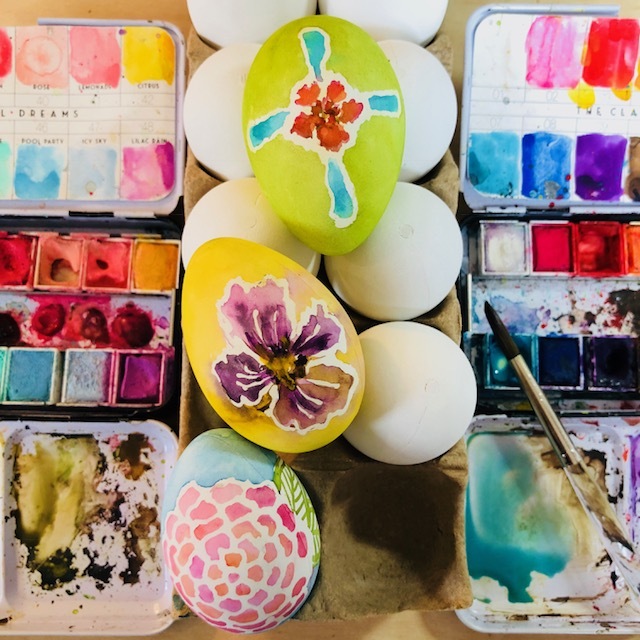 Want to know how to create Easter egg designs using the amazing resist pen created by fellow licensing artist friend Christine Adolph? It’s so much fun! Unfortunately I think this one is out of stock but here’s a link to another resist pen on Amazon. Let the resist dry completely, then paint… let it dry again and rub the resist off and voila! Use your watercolors from Prima Marketing Inc. for vibrant colors. Endless possibilities! Get creative, sweet chicks! Another fun way to decorate Easter eggs (paper mache or real) is to use acrylic paint to create abstract designs. Swing by your local Michael’s for some colorful Martha Stewart acrylics and get creative! My favorite is adding tiny details with metallic gold!